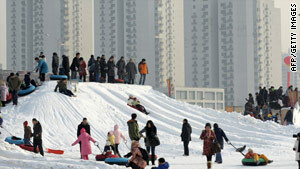 Tourists enjoy snow surfing at a resort by a high-rise apartment buildings in Beijing. Beijing, China (CNN) -- Snow and freezing temperatures in China's western Xinjiang autonomous region have killed at least four people, state media reported Monday. Nearly 300 casualties had been reported and at least 960,000 people had been affected, the Xinhua news service said, without clarifying the figures. It also reported that 16,000 houses had been destroyed. Economic damages were estimated at 320 million RMB ($47 million), and the government had spent 40 million RMB ($5.9 million) on disaster relief, Xinhua said. A new wave of cold gripped the region on Monday, with temperatures well below freezing.